Last year all we heard was talk about Disclosure and how it was important to disclose anytime you received compensation from writing a post. In the US, it’s required by the FTC that you must disclosure any material connections. Canada doesn’t have anything like this, but since I work with many US companies I also put them in my posts as well. It’s hard to know when to disclose and what to say. I decided to get myself organized and write up some disclosure statements that can easily be copied into posts. 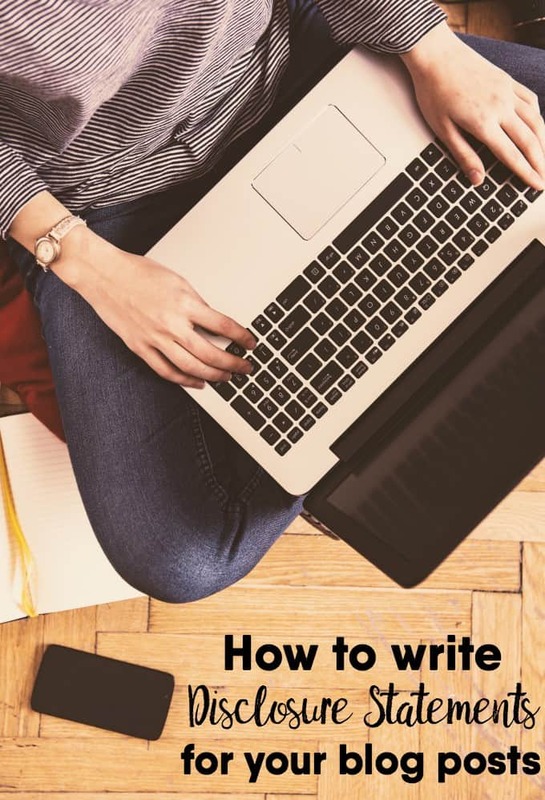 I get asked this question a lot by other bloggers about what to say so I decided to share how to word them with all of you! Here’s a list of all the types of posts you might write for your site and a suggestion with what your disclosure statement could say. Feel free to tweak to suit your needs and preferences. Can be done through a sitewide Disclosure policy (as ProBlogger does) or you can have a statement at the end of each post saying something like, “This post contains affiliate links”. I have a Disclosure policy on my site and you can easily get one for yours too. Go to DisclosurePolicy.org and do the easy little policy generator! Another site that you might find helpful is CMP.ly. It has examples of posts and the various disclosure statements that go with them! Thank you for posting this! I have just started to write reviews. This is very helpful. This is a great starting point for writing disclosures, and very helpful as I’ve been brainstorming how to go about writing one for a new project. I just wonder if receiving products to review would be considered compensation under the new guidelines. Thanks Stacie! I’m surprised by the number of bloggers I see who do not disclose affiliate links. Oh thank you so much for this post! This is something that I did not really have to think about before, but now I am entering in to the realm of reviews and giveaways and affiliate and all that fun stuff, but I was never sure what I should write and when to write it. This is perfect! As always…you are awesome! Thanks Staci! So very helpful! I have a site wide disclosure up on one of my sites, which includes the fact that most of the links I use are affiliate links… I should probably put one up on my other one too but haven’t gotten around to it. I hope they don’t bring the laws to Canada. Posting the same disclosure on every post would annoy me way too much. Thanks so much Stacie. This is very helpful. Another great post Stacie! Thanks for sharing! More fabulous info from you. Thanks so much! Thanks for sharing! I include statements similar to yours in my posts. Plus, I have a general site disclosure. I had a disclosure statement made as a page on my blog and at the end of each post it is automatically added to each blog post so I dont have to worry about including it each time or forgetting it. I always add an extra disclosure at the end of reviews/giveaways though that is directly in the particular post. I got my disclosure policy off disclosurepolicy.org. Very helpful. Thanks for this post, I really need to do this. I already use this. It was so simple to do! I’ve heard various things about disclosing affiliate links so I’ve added to my Disclosure policy and try to remember to add it to each post as well. My theory is “when is doubt disclose” if a company doesn’t want me to disclose that it is sponsored, I don’t work with them. Great, Great tips!! Thanks a ton for these Stacie.. Lovin’ all that you do for newer (and older) bloggers! Bookmarked!! You always have the best stuff! This really helps a lot. My disclosures always look the same no matter what I’m disclosing. Thanks! Hi, I enjoyed your article and stumbled, have a nice day. your blog came up when I did a Google search on writing disclosure statements. thanks for posting. your advice made my things much easier for me as a new blogger with plans to monetize my content. Easy and done! Disclosure statement done in minutes. I love it! Thanks! On each post I have at the bottom of the post that it may contain affiliate link and to see my disclosure page. Is that okay you think? For affiliate posts or reviews? Thanks so much – this was really helpful! Thank you so much for this post. I’ve been looking all over for reading material on this. Great information, just starting out and this helped a bunch. Thanks. I’m so glad I found this post as it had everything I was looking for. Jackpot! I just updated my disclosure statement and appreciate all of your advice. Thanks for sharing your tips! Thanks for the great info. I need to add this to my blog! You’re the best! Thanks for the full post! It really gave us the head start we needed! Thank you for this post! I will edit my past blog posts and write the needed disclosure statements. Thanks for this! Pinned for future reference and using it right now! 🙂 Thank yo Google! I didn’t know disclosurepolicy.org even existed – that certainly saved me some time! Thank you so much for this post! Thank for the information! However the part about affiliate links is inaccurate. Affiliate links must be disclosed BEFORE anyone ever clicks on a link. Posting at the bottom doesn’t cut it.